Connection design is critical in timber buildings since the connections tend to have lower strength than the structural members themselves and they tend to fail in a brittle manner. 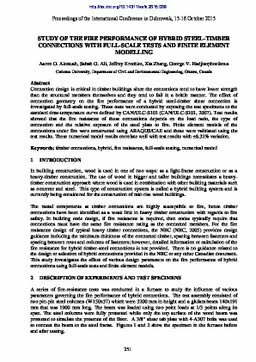 The effect of connection geometry on the fire performance of a hybrid steel-timber shear connection is investigated by full-scale testing. These tests were conducted by exposing the test specimens to the standard time-temperature curve defined by CAN/ULC-S101 (CAN/ULC-S101, 2007). Test results showed that the fire resistance of these connections depends on the load ratio, the type of connection and the relative exposure of the steel plate to fire. Finite element models of the connections under fire were constructed using ABAQUS/CAE and these were validated using the test results. These numerical model results correlate well with test results with ±8.32% variation.